Investor-state arbitrations can affect important areas of public policy – from environmental protection to public health. Yet many people may have never heard about this mechanism for settling disputes between investors and states, particularly in low and middle-income countries. How can civil society promote public awareness and scrutiny? Two civil society practitioners recently shared their experiences during IIED's second Legal Tools webinar. Around the world, citizens' groups are taking action to change how investments in natural resources are made – to protect the rights of citizens and to protect the environment. It is increasingly clear that this citizen advocacy on natural resource investments cannot ignore investor-state arbitration – a mechanism through which disputes between investors and states are often settled that was relatively obscure until recently. If community and civil society mobilisation on an investment persuades the government to revise terms or even cancel a deal, investors could take the government to arbitration to claim damages for losses suffered. The ways in which these disputes are settled, and whether citizens' concerns can be considered, can affect the extent to which investments respond to local development agendas as well as commercial considerations. Civil society advocacy on investor-state arbitration formed the object of the latest webinar organised as part of the Legal Tools for Citizen Empowerment initiative – an effort to test approaches, document lessons and share tools and tactics among practitioners on how to strengthen local rights and voices within natural resource investments. At the webinar, Marcos Orellana, of US-based Center for International Environmental Law (CIEL), and Jason Brickhill, of South Africa's Legal Resources Centre (LRC), shared lessons from their practical experience of investor-state arbitration. Investor-state arbitration settles disputes between an investor and a host state using an international arbitral tribunal. Most of the more than 3,000 international investment treaties currently in force worldwide allow investors to take disputes to arbitration. National legislation and investor-state contracts may also provide for arbitration. The investor typically alleges that the state has violated a legal commitment, and will usually seek compensation. The arbitral tribunal issues a binding award — effectively a document similar to a court judgement. The compensation amounts awarded can be very large, with the highest known award for US$1.7 billion. Even if a government wins, it may have to cover its own substantial legal costs. There is usually no formal appeal against arbitral awards, although there may be opportunities to set aside awards on narrowly defined grounds. What's more, arbitral awards are backed up by effective enforcement mechanisms that help investors get the money they have been awarded, so arbitration can have serious financial implications. Investments in mining, petroleum and agriculture have featured prominently in arbitration; these sectors account for around one third of all arbitrations brought to an important arbitration forum. Investor-state arbitrations can arise from opportunistic state action that unfairly undermines investors' businesses. But it is important to remember that the range of public policy measures challenged can be very broad, and important public interests can be at stake. Over the past few years, investors have brought claims to seek compensation for losses caused by government action to improve public revenues, impose performance requirements, address historical injustices or protect the environment or public health. 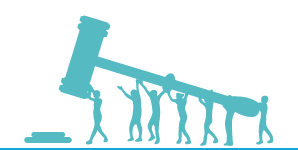 Over the past 10 years, civil society organisations have pioneered new ways to ensure that investor-state arbitration considers public interest factors, including in relation to natural resource investments. One approach has been to seek to intervene in individual arbitral proceedings where public interests were deemed to be at stake, and the webinar shared several lessons from experiences in this area. In his presentation, Orellana discussed key concepts about international investment treaties and arbitration, and elaborated on how human rights issues may be at stake. He also shared lessons from CIEL's extensive experience with filing civil society submissions in a wide range of contexts. These submissions enable civil society to raise public interest issues they would like the tribunal to consider. The webinar enabled the criteria applied by arbitral tribunals in deciding whether to allow a civil society organisation to make such a submission to be discussed, and highlighted a few cases where submissions were allowed. Brickhill spoke about the experience of LRC in obtaining permission from a tribunal to make a submission to an arbitration involving an investor’s challenge to measures adopted by South Africa to deal with the legacy of apartheid. He also shared lessons from a legal and a practical perspective – discussing the legal outcomes sought with the submissions but also the development of a coalition of national and international organisations that could lead the submission. Do civil society submissions make a difference? The discussion of civil society submissions triggered much interest among participants of the webinar, and prompted a number of questions and comments. Asked about the difference a submission to an arbitral tribunal can make to legal and practical outcomes, Orellana argued that civil society submissions have proved useful in helping arbitral tribunals to understand the fuller circumstances of a case. In some cases, tribunals have taken into account civil society submissions in developing the ruling, and have even referenced the submission in the award. But organising a submission can also be useful outside the arbitral proceeding, as a catalyst for coalition building, advocacy and national debate. Orellana mentioned a recent submission with which he was involved, concerning a mining project in El Salvador, when he felt that the process of developing the submission was instrumental to promoting national debate on mining in the country. Beyond advocacy on individual arbitral proceedings, civil society has been playing an important role in promoting systemic change in investor-state arbitration. One participant asked about the most effective targets for advocacy strategies: how to balance the advances that can be achieved through engaging with individual arbitral proceedings with the need to promote change in fundamental policy choices about arbitration. Some states have become more aware of the liabilities that arbitration can entail, and are reconsidering their approaches. For example, Bolivia, Ecuador and Venezuela have withdrawn from the ICSID Convention, while other countries (such as South Africa and Indonesia) have terminated several investment treaties. The Australian government has also taken a more cautious stance on arbitration. Civil society scrutiny has been an important driver in these developments. In Europe, proposals to include an investor-state arbitration clause in the ongoing negotiation of a EU-US Transatlantic Trade and Investment Partnership treaty has triggered much civil society advocacy. In response, the European Union has launched a public consultation, and recent developments suggest that some EU member states no longer support the inclusion of investor-state arbitration in the treaty. There is also a growing international debate about possible multilateral initiatives to reform investor-state arbitration. For example, some commentators have proposed an appeals system. UNCITRAL has recently launched a repository of arbitration documents after its new transparency rules came into force, and is considering developing a multilateral convention on transparency in investor-state arbitration. These debates have so far been dominated by legal professionals and high-income countries. But it is essential that governments and civil society from low-income countries also drive the reform agenda to ensure it meets their concerns and aspirations. The next Legal Tools webinar will take place in June 2014 and will discuss sustainability and scalability in legal empowerment interventions.